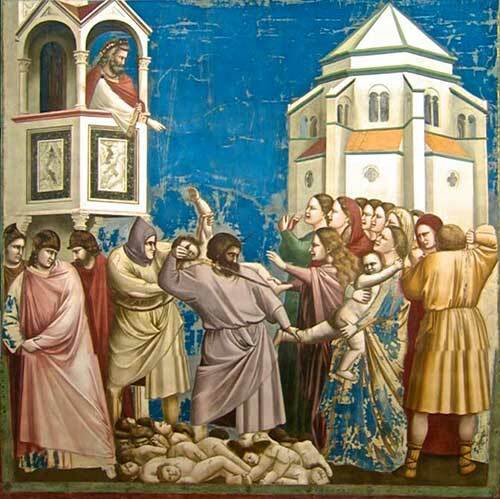 The fresco below, representing the Massacre of the Innocents, was done by Giotto, the famous medieval Italian painter. It was painted between 1302 and 1306 and is exposed in the famous Chapel of the Scrovegni, in Padua. Around the time of the birth of Our Redeemer, Herod, the Tetrarch of Galilee, ordered all boys under two years of age to be killed because the wise men had naively asked him if he had heard about the newly born king of the Jews. Herod, figuring that there was not room on the throne for two kings, believed it necessary to eliminate that Boy. He had his soldiers look for the Child everywhere, but He was not found. So Herod ordered the slaughter of the innocents. They were the first martyrs of the Catholic Church. Why martyrs? For a very simple reason: they were killed out of hatred for the faith and for God; out of hatred for the Child who had given them the honor of being born roughly at the same time He came into the world. Having been murdered for these reasons, they went to heaven as martyrs. They are the Holy Innocents. When the Angels appeared on Christmas Eve, they proclaimed: “Glory be to God in the highest, and peace on earth to men of good will.” But the first actions that unfold from that day full of light, blessing and peace, are also laden with threats regarding the future. For a superficial mind, this seems to be in contradiction with the phrase “peace on earth to men of good will.” One has the impression that men of good will would neither suffer persecutions nor have to fight. Probably some of the fathers and mothers of those children depicted in Giotto’s fresco were men of good will. Nevertheless, what happened to them? An immense tragedy: their children were slaughtered. Herod appears on a sort of balcony, ordering the massacre. One sees the executioners looking for children whom their parents are trying to hide. In the foreground, one sees a woman who obviously does not want to give up her son. Nearby, one notices scenes of agitation and violence. It is indeed a dramatic scene. Someone could ask, “Were they not baptized?” The answer is that they were baptized in their own blood; they were graced with the so-called “baptism of blood.” And they are, as far as one can see, the first deceased Christians to benefit from the merits of Our Lord Jesus Christ shortly after their own birth.